Sri Chaitanya Mahaprabhu was born in Navadwip, situated on the bank of the holy Ganges river in Begal, in February 1486, during the eclipse of the full moon amidst the loud chanting of the Holy Name of the Lord. His father, Jagannatha Misra and mother Sac i, were both from pious and scholarly brahmana families originally from Sylhet. After loosing their first eight children, all daughters, they gave birth to a son named Visvarupa, who took sannyasa at an early age. Then Sri Chaitanya appeared from the womb of mother Sachi and was given the name Visvambara. Sri Chaitanya showed great attachment to the Holy name from birth. He would often cry and could not be consoled until the people around him began to chant Hare Krishna. He was nicknamed Nimai and would was very fond of singing and dancing. With uplifted hands He seemed to dance in a fit of divine madness, which enraptured all and made them dance and chant along with him. Nimai studied under Ganga dasa Pandit, the most learned scholar in Navadwip. Although there were many students in His school, some of which were much older and very learned, Nimai eclipsed them all by His extraordinary intelligence. A favorite pastime of His was challenging students from other schools in intellectual debates on the bank of the Ganges. He would offer His own explanation on certain Sutras and ask others to criticize it. On their failing to find any flaw, he would Himself point out a number of flaws and offer another explanation which he would again criticize to re-establish his original explanation with extraordinary skill and felicity. He acquired mastery over the different branches of Sanskrit learning at a very early age and became known by the name Nimai Pandit. After the death of His father he married Laksmipriya and set up a school where he taught grammar. He was imbued with scholastic spirit and indulged in dialectical bouts with the scholars of Nadia. In one such bout he defeated the world conqueror (Digvijaya Pandit Kesava Kashmiri), whom the blessings of the goddess of learning Saraswati, had made him invincible. It was later revealed to the Pandit in a dream that the man who had vanquished him was the Lord Himself. When Nimai was about twenty-two years old he went on a tour to Sylhet in East Bengal. During His absence His wife Laksmipriya died of a snake bite. Later, at the request of His mother he was remarried to Vishnupriya. Keeping time with His hands, the pupils went round and round repeating the song. As the song and the dance went on their hearts were filled with ecstasy and tears of joy flowed from their eyes. Many people from the neighborhood were attracted to the scene and everyone who came as a spectator was caught in the current of devotion and began to sing and dance. This marked the beginning of the sankirtana movement of Sri Chaitanya Mahaprabhu, the prophesied mission of His appearance. Sri Chaitanya Mahaprabhu was soon joined by His principal associates, Nityananda, Gadadhara, Sri Advaita and Srivasa Pandit. Many thousands of people became influenced by the sankirtana movement. In the courtyard of Srivasa Thakura He held nightly sankirtana with His very close associates. There He revealed His Divine Forms to His followers and indicated that His mission was to deliver all the fallen souls of kali-yuga. The courtyard in the house of Srivasa Pandit became the regular meeting place for the Vaisnavas but soon there was organized sankirtana parties and processions of which thousands upon thousands of people participated, parading through the streets of Nava dwip, singing and dancing and surcharging the whole atmosphere with this unique spiritual fervor. Once, a small but influential group, proud of their learning and maintaining an inimical attitude towards the sankirtana movement, placed a complaint before the Chand Kazi, the Mohamedan governor of the town. The Kazi tried to crush the movement, breakin g mrdangas and stopping the processions. But due to the overwhelming influence of the huge congregational gathering organized by Sri Chaitanya Mahaprabhu, in a defiant display of peaceful civil disobedience, the Kazi not only came to his senses, but joined the movement of Mahaprabhu and declared to the world that this movement will never be impeded. At the age of twenty-four Nimai Pandit decided to take to the renounced order of life. He accepted sannyasa initiation from Kesava Bharati and received the name Sri Krishna Chaitanya. Soon after He journeyed to Puri where he converted Sarvabhauma Bhattacary a, a veteran scholar of nyaya and Vedanta. The Bhattacharya recognized Him to be the Supreme Personality of Godhead Himself and became so attached to Him that he could bear anything in the world but separation from Him. Sri Krishna Chaitanya Mahaprabhu soon embarked on an extensive journey through the south of India to the tip of Cape Comorin. Then He turned northwards and after visiting many of the important temples and holy rivers, returned to Puri. His influence on the people of Orissa was epitimized when He captured the heart of the Orian King, Pratparudra. Yearly the devotees from Bengal would come to visit Him and this became and annual pilgrimage for the Bengalis. In the year 1514 Sri Chaitanya started on a pilgimage to Vrindaban. Traveling through Bengal, Sri Chaitanya met two brothers who were ministers in the court of the Mohamedan king Hussain Shah of Bengal. They were known by the Mohamedan names of Saker Mali k and Dabir Khas. Won over by Sri Chaitanya they became his disciples and given the names Sanatana and Rupa. These two brothers along with their nephew Jiva are the great pillars of faith, upon whose writings rests the theological and philosophical foundations of the Gaudiya sampradaya. Sri Chaitanya had tried going to Vrindaban a few times before with a large accompaniment of followers. This time however He went with only two people and traveled through the forests in order to be unnoticed by the masses. In Vrindaban He was always over welmed in ecstacy and absorbed in the mood of Radha and Krishna. He uncovered the sites of the divine Radha Kunda and Syama Kunda. Everyone He met on His travels He induced to chant the holy name of Krishna merely by the sight of Him. Returning from Vrindaban He stayed at Allahabad for some time during the Kumba Mela. Here he met a Vaidika brahmana named Vallabha Bhatta, who is also known as Sri Vallabhacharya, the founder of the Vaisnava sect of that name. Here He also met Rupa and his younger brother Anupama, who had renounced the world for His sake and come all the way from Bengal to receive His instructions. Mahaprabhu gave them detailed instructions on Bhakti for ten days and sent them to Vrindaban comm issioning Rupa to devote himself to the preparation of foundational literature for the propogation of Bhakti. Proceeding to Varanasi He met Sanatana, the elder brother of Rupa. 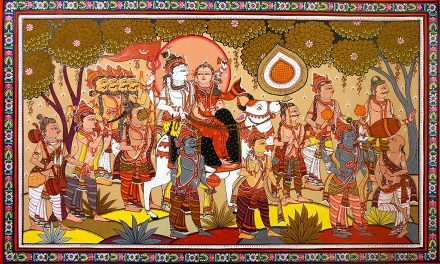 Sanatana had been imprisoned by the king, because his meeting with Sri Chaitanya had brought a complete change in his state of mind, and he was not able to attend to the duties of his ministerial office. He managed, however, to escape from prison and go in disguise to Varanasi to surrender himself completely at the feet of his maste r. Sri Chaitanya gave him elaborate discourses on bhakti and commissioned him as well with the task of laying more secure foundations of Vaisnavism by rediscovering the holy places in Vrindavana, building temples and producing canonical literature. An important event at Varanasi was his triumph in theological discussions over the Mayavadi Sannyasis, who followed the path of jnana and deprecated Bhakti as pure sentimentalism. The result was the conversion of Prakasananda Sarasvati, the head of the mayavadi sannyasis of Varanasi, along with many of his followers. Sri Chaitanya returned to Puri. For six years after taking to the sannyasa order He traveled all over the country, broadcasting the seeds of Bhakti. These seeds having sprouted and taken root meant He could now leave the plants to the care of His able leiutenants, and pass the remaining eighteen years of His life in monastic seclusion at Puri. He settled permanently in the house of Kasi Misra and all His days were spent in deep communion with the Lord, interrupted only by the occasional conversations with a few of His most intimate disciples.